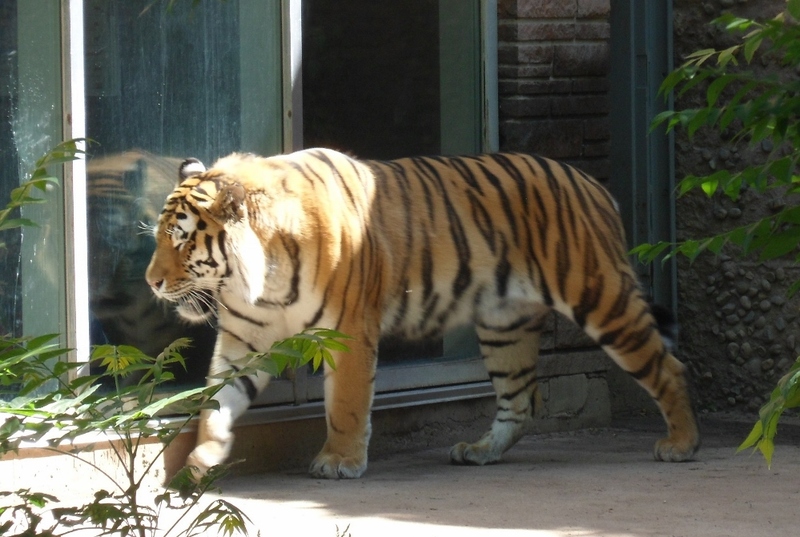 That glass he's pacing in front of is a viewing window for visitors to get a more up-close and personal glimpse of their beautiful Siberian Tiger. While I was inside (barely holding myself back from plastering my face against the glass) there was a woman with a baby in her arms -- I don't know how old. Less than a year, at a guess, but don't quote me. Every time the tiger paced TOWARD us, this kid would BURST into tears. She/he definitely has a stronger survival instinct than I do! To be fair, this tiger was massive. Just incredible to see and have that perspective up-close. In a lot of the zoos I've been to, guests were primarily looking down on them from a distance, in a pit, or across a moat, and it definitely makes a difference to have the nearer view. I mean, I've met a tiger in person up-close and personally before (and told that story here!) but she was downright petite compared to this guy. 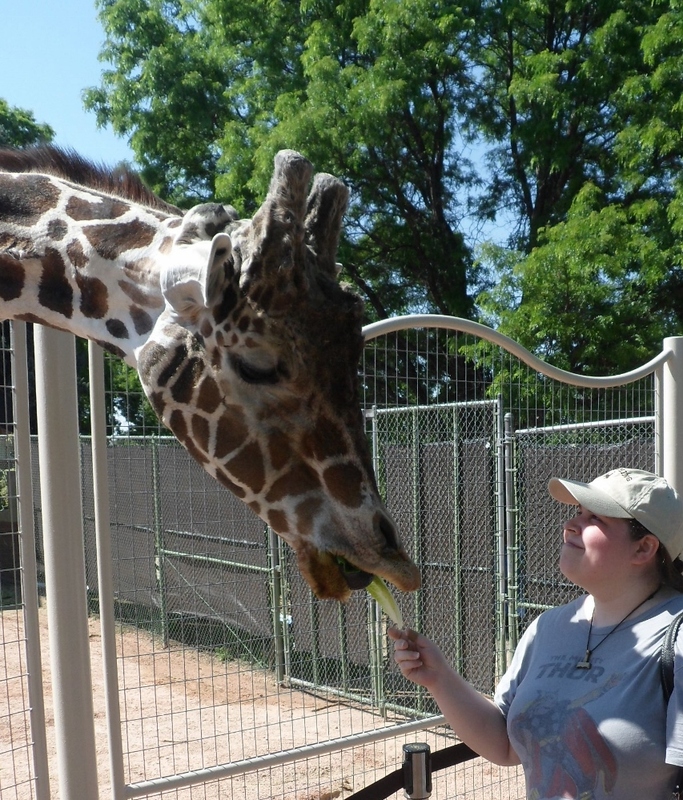 We also had the opportunity to feed the Giraffes, which offered another dose of size-perspective. See that guy's head? It's MONSTROUS. Because Giraffes are MONSTROUSLY LARGE. (And I don't care what anyone says, herbivores of that size are WAY more terrifying than the largest predators.) His eye is bigger than my HAND you guys. LOOK AT IT. LOOOOOK! And then we saw the Gorillas. You have to understand that I studied wildlife biology in college before I made the switch to classical studies. 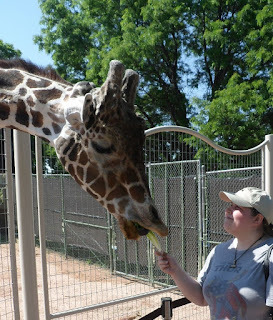 My career goal while I was working toward that degree was to become a zookeeper. I wanted desperately to work with animals -- because I love them. Always have. Always will. Particularly big cats and large predators. And I also believe that zoos are necessary to conservation. There are too many people who would not think twice about the plight of an endangered species if they had not gone to the zoo as a kid and fed the giraffes, or saw the elephant paint, or pressed their face up against the glass and looked into the eyes of the pacing tiger. We need to SEE these animals in order to care about them as individuals, rather than abstract concepts -- and in that respect, the animals in zoos (and marine parks) are ambassadors for their species. They are (perhaps unwittingly) sacrificing their freedom for their wild cousins, and I know that accredited zoos are doing their very best for the animals in their care via vets, nutrition, social/enrichment activities and so on, because the people who become zookeepers LOVE these animals, too. 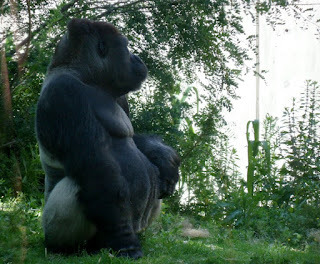 But it hurt my heart to see the Gorillas in their enclosures. It broke me to look into their eyes, to watch their casual so human movements and gestures. It's SO easy to see the intelligence, the consciousness and the sentience in gorillas. It's easy to look at them and see them as people. And it hits hard, the realization that these people are caged for our gawking pleasure. That we need them to be, because otherwise there wouldn't be enough goodwill to keep them alive anywhere on this planet. For the time being, I can only hope seeing the gorillas made everyone else just as uncomfortable as it made me, so maybe when they get that flyer from some wildlife org needing donations to save the tiger or the gorilla or the maned wolf or, or, or, they'll remember that moment, and do what they can to help.